The dissolution of salts is a very common phenomenon in our daily life. Salt dissolution is also a very important scientific problem, since it plays crucial roles in atmospheric chemistry, weathering, biology, and water purification. However, a detailed understanding of salt dissolution is still lacking, despite tremendous experimental and theoretical efforts. One main reason is that atomic-scale characterization of salt dissolution is extremely challenging. NaCl dissolution at ambient temperature has been widely investigated, revealing that the NaCl dissolution starts from the sites of least coordination such as the corner sites or the edge sites of NaCl surfaces. It has been inferred that the Cl– prefers to dissolve prior to Na+. Considering the abundance of ice-coated NaCl aerosol particles under atmospheric conditions, it is also very important to understand NaCl dissolution below freezing point and check whether the above picture of NaCl dissolution is still valid at low temperature. In our recent article in Journal of Physics: Condensed Matter , we report the real-space observation of the dissolution of Au-supported NaCl islands by water with atomic precision using low-temperature STM. We find that the detachment of a single Na+ is greatly facilitated by a single water molecule on the STM tip even at 5 K, while the Cl– sites remain intact. When covered with a full water monolayer, the NaCl (001) bilayer islands start to dissolve from the step edges and also show evidence of dissolution inside the terraces as the temperature is raised to 145 K. At 155 K, the water molecule completely desorbs from the surface, which was accompanies the decomposition and restructuring of bilayer NaCl islands. Left: a NaCl island being dissolved by the water, showing some cloud-like features. Right: dissolved NaCl island with some reconstructions. © Ying Jiang 2017. All rights reserved. These results suggest that the NaCl dissolution may occur well below the freezing point at the ice/ NaCl interface, and may be mainly driven by the interaction between the water molecules and the Na+, which is in clear contrast with NaCl dissolution in liquid water. This work not only sheds new lights on the initial stage of the NaCl dissolution process at the microscopic level, but also serves as an important step toward understanding the NaCl dissolution process under atmospheric conditions, where sea salt particles are usually coated with ice overlayers . Currently, our group is developing state-of-art scanning tunneling microscopy/spectroscopy, which allows access to the quantum degree of freedom of protons with atomic precision [3,4]. Combined with ab initio path integral molecular dynamics (PIMD) simulations, we have made groundbreaking steps towards understanding the nuclear quantum effects of water/ice [4,5]. Those findings may revolutionise our understanding of water/ice and provide explanations for the many strange properties of water/ice from a quantum mechanical viewpoint. Jinbo Peng, Jing Guo, Runze Ma, XiangzhiMeng, Enge Wang, and Ying Jiang†. 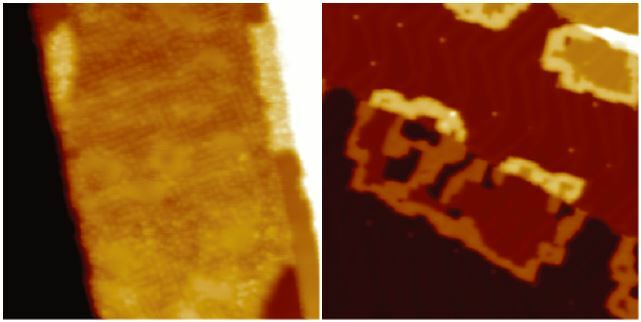 Atomic-scale imaging of NaCl dissolution by a two-dimensional ice overlayer. Journal of Physics: Condensed Matter. 29, 104001 (2017). Ji Chen, Jing Guo, Xiangzhi Meng, Jinbo Peng, Jiming Sheng, Limei Xu, Ying Jiang, Xin-Zheng Li, &En-Ge Wang, An unconventional bilayer ice structure on a NaCl(001) film. Nature. Communications. 5:4056 (2014). Jing Guo, XiangzhiMeng, Ji Chen, Jinbo Peng, Jiming Sheng, Xin-Zheng Li, Limei Xu, Jun-Ren Shi, Enge Wang & Ying Jiang, “Real-space imaging of interfacial water with submolecular resolution”, Nature Materials. 13, 184 (2014). Jing Guo, Jing-Tao Lü, Yexin Feng, Ji Chen, Jinbo Peng, Zeren Lin, Xiangzhi Meng, Zhichang Wang, Xin-Zheng Li, En-Ge Wang, Ying Jiang, Nuclear quantum effects of hydrogen bonds probed by tip-enhanced inelastic electron tunneling. Science 352, 321 (2016). Xiangzhi Meng, Jing Guo, Jinbo Peng, Ji Chen, Zhichang Wang, Jun-Ren Shi, Xin-Zheng Li, En-Ge Wang, Ying Jiang. Direct visualization of concerted proton tunneling in a water nanocluster. Nature Physics.11, 235-239 (2015). Jinbo Peng and Runze Ma are PhD students in School of Physics at Peking University. Their researches focus on the investigation of atomic structures and dynamics of water and hydrates with combined STM and AFM. Jing Guo is a postdoc researcher in School of Physics at Peking University where she also got her PhD degree under the supervision of Professor Ying Jiang. Her research is the investigation of nuclear quantum effects of interfacial water at atomic scale with combined STM and AFM. Xiangzhi Meng is a postdoc researcher at the University of Münster in the group of Professor Harald Fuchs. He got his PhD degree in the School of Physics at Peking University, where he worked on the atomic-scale ultrafast dynamics of water and TiO2 with a laser-assisted STM. Ying Jiang is a tenured associate professor in School of Physics at Peking University. His team is currently interested in the development of advanced scanning probe microscopy and spectroscopy, and the ultrasensitive detection of novel quantum states in single molecules and two-dimensional materials.